A beautiful double knotted strand of 107 creamy white pearls, approx 6.0-6.5mm. 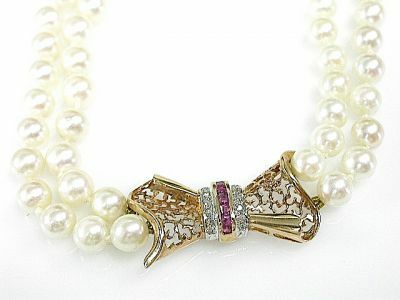 The pearls are accompanied by a 14kt yellow gold and rhodium plated bow divider and rectangular filigree clasp. The divider is set with 7 square cut medium intense purplish red rubies, est. 0.39ct and 14 single cut diamonds, est. 0.11ct (clarity: I1-I2 & I-J colour). The necklace is approx. 16 inches (40.64cm) long.